Faleen is a Redguard warrior and the housecarl of Jarl Igmund of Markarth. She can be found in Understone Keep. Another inhabitant of the keep is romantically interested in her, as revealed in The Book of Love. 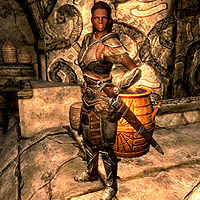 If Igmund has been removed as the Jarl of Markarth, she can be found with him in the Blue Palace. She wears a random set of steel armor and is armed with a steel sword with a steel shield, supplemented by a long bow with twelve steel arrows. She also carries a belted tunic and a random selection of common loot and gold. If Faleen is the target of a radiant quest (such as Hired Muscle), you will be told to go Markarth even if she has relocated to the Blue Palace. However, the quest marker will point to the correct place. This page was last modified on 9 January 2014, at 16:51.